Father John Misty has announced a new live album, Father John Misty: Live At Third Man Records, out September. 28th through Third Man Records. Third Man has hosted multiple notable performances in the Blue Room, and the concerts are all recorded direct to acetate for vinyl pressings. Pure Comedy brought the universe into his musical world, grand-scaling both Tillman’s cleverness and an earnest love for humanity, On God’s Favorite Customer, he sounds all by himself wracked with self-doubt, on the verge (perhaps at the apex) of hopelessness. He’s his comically dark self during hazy nightmare “Mr. Tillman,” mind fractured and teetering at the edge of bender doom in a hallucinogenic hotel. “Hangout At The Gallows” is positively, dreamily dour, and “The Palace” is nearly cripplingly lonesome. There’s little to adorn most of these songs lyrically economical, sonically without much pageantry—but the intimacy and honesty results in some of Tillman’s most stunning songwriting. On the aching “Just Dumb Enough To Try,” he forces a death grip on hope for the victory of love and self-betterment, against all odds, and “The Songwriter” deftly examines the destruction that can be inherent when your partner is your muse. “Please Don’t Die” rolls easy with an understated twang, howling harmonica, and twinkling piano, combining some of Tillman’s best moves heart-baring vulnerability, swirling melodies, and just a touch of the surreal—to convey that familiar feeling of when we just can’t stand to lose someone. He turns from the safe, Randy Newman-styled of piano-lead singer-songwriter tunes to embody elements of vintage psychedelic pop and flex his vocal range. “Date Night” and “Mr. Tillman” are both short, funny songs perfectly poised to become radio hits. Ballads “The Songwriter” and “The Palace” sound more like traditional Misty, but are more sad than purely cynical. It seems Tillman has gotten over his hatred of everyone and everything, and given us an album with songs that both put us in our feels and deserve to be belted out in angst. Father John Misty has announced he’ll be coming to Leicester’s De Montfort Hall and The Forum, Bath (Official) later this year as part of his 2018 World Tour! see dates on the top header. God’s Favorite Customerreveals a bittersweetness and directness in Tillman’s songwriting, without sacrificing any of his wit or taste for the absurd. From “Mr. Tillman,” where he trains his lens on his own misadventure, to the cavernous pain of estrangement in “Please Don’t Die,” Tillman plays with perspective throughout to alternatingly hilarious and devastating effect. “We’re Only People (And There’s Not Much Anyone Can Do About That)” is a meditation on our inner lives and the limitations we experience in our attempts to give and receive love. It stands in solidarity with the title track, which examines the ironic relationship between forgiveness and sin. Together, these are songs that demand to know either real love or what comes after, and as the album progresses, that entreaty leads to discovering the latter’s true stakes. God’s Favorite Customer was produced by Tillman and recorded with Jonathan Rado, Dave Cerminara, and Trevor Spencer. The album features contributions from Haxan Cloak, Natalie Mering of Weyes Blood, longtimecollaborator Jonathan Wilson, and members of Misty’s touring band. “God’s Favourite Customer” is out 1st June on Bella Union Records. Father John Misty has shared a new stop-motion video for his song ‘Please Don’t Die.’ A track and video which follows FJM in to the Underworld to literally confront death face to face. With new album God’s Favourite Customer on it’s way to our ears on Friday 1st June, we are still as excited as little pups to see another instalment of the Josh Tillman experiment, and this one satisfies in so many ways. Created by the brilliant artist Chris Hopewell (the man behind Father John’s “…Revolution” video, Radiohead’s ‘Burn the Witch,’ Run the Jewels’ ‘Don’t Get Captured,’ and a more) it’s a child-like view of mortality which is endearing and confusing. So while we wait for the new LP to drop via Sub-Pop/Bella Union this comng Friday, sit back and enjoy this brilliant piece of work from both the singer and the visual creator. Father John Misty has shared his disorienting new video for “Mr. Tillman,” the first single off his upcoming new album God’s Favorite Customer. Just as the song’s lyrics zero in on the singer’s unpleasant experience at a hotel, the “Mr. Tillman” video is like The Shining meets “Hotel California,” as Father John Misty is doomed to relive his stay and inability to leave countless times. The result is interactions with doppelgangers, an attempted suicide and a taxicab escape. Father John Misty has previously released two songs, “Disappointing Diamonds Are the Rarest of Them All” and “Just Dumb Enough to Try,” from his forthcoming album God’s Favorite Customer, the speedy follow-up to 2017’s Pure Comedy. God’s Favorite Customer arrives June 1st. “Mr. Tillman” is off of Father John Misty’s upcoming album, God’s Favorite Customer, out June 1st on Sub Pop and Bella Union. After information about his new album leaked, Father John Misty has formally announced the release of his fourth album, God’s Favorite Customer, along with two new singles. A press release issued by Sub Pop Records, confirms the leaked album, including the tracklist, the album art (photographed by Pari Dukovic), and the June 1st release via Sub Pop and Bella Union Records. The follow-up to Pure Comedy was written and produced by Misty, and recorded with Jonathan Rado, Dave Cerminara and Trevor Spencer. While the official album news is exciting, the real excitement comes in the full versions of the songs “Just Dumb Enough to Try” and “Disappointing Diamonds are the Rarest of Them All,”. Each song gives Misty a different angle by expanding his sound while staying true to his indie folk-rock roots. Both songs seem to be a nod to classic, 1970s Elton John, as “Just Dumb” goes for full singer-songwriter glory, with its lush production of jangling guitars and delicate strings leaning towards classic John ballads like “Candle in the Wind” and “Goodbye Yellow Brick Road.” “Disappointing Diamonds” is more of a throwback to “Benny and the Jets” and “Crocodile Rock” with its zany production built on huge piano chords and zooming electric guitar riffs. The title track, which examines the ironic relationship between forgiveness and sin. Together, these are songs that demand to know either real love or what comes after, and as the album progresses, that entreaty leads to discovering the latter’s true stakes. God’s Favorite Customer is available for preorder now on Father John Misty’s official store along with Sub Pop, Bella Union and select independent retailers in five formats: limited Loser edition on metallic purple vinyl, standard LP on black vinyl, CD, streaming and digital download, and cassette. In addition to the album release, Misty will go on tour starting in April, in support of the album with Gillian Welch, TV on the Radio and Jenny Lewis serving as special guests at select shows. Hopefully, the rest of 2018 will be filled with new surprises Misty has a hand in. Listen to “Just Dumb Enough to Try” and “Disappointing Diamonds are the Rarest of Them All” below. Father John Misty’s new song “Just Dumb Enough to Try” is off of his upcoming album, God’s Favorite Customer, out June 1st on Sub Pop and Bella Union. God’s Favorite Customer was produced by Tillman and recorded with Jonathan Rado, Dave Cerminara, and Trevor Spencer. The album features contributions from Haxan Cloak, Natalie Merring of Weyes Blood, longtime collaborator Jonathan Wilson, and members of Misty’s touring band. Father John Misty’s new song “Disappointing Diamonds Are the Rarest of Them All” is off of his upcoming album, God’s Favorite Customer, out June 1st on Sub Pop and Bella Union. 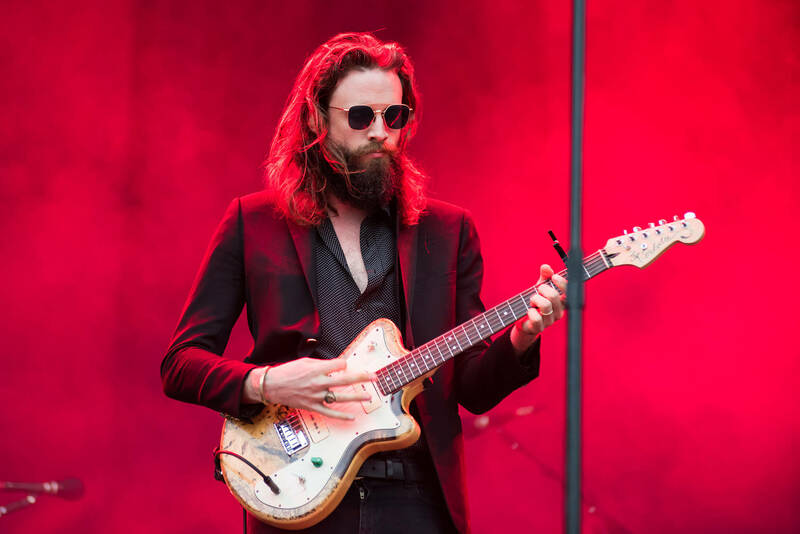 Father John Misty kicked off his ACL debut with the title track of his critically-acclaimed 2017 release “Pure Comedy”. His episode premieres January 6th. Watch Austin City Limits on PBS. For more visit acltv.com. About the Episode Enjoy an hour of unconventional rock with Father John Misty and the Black Angels. Singer/songwriter Father John Misty showcases the lush sarcasm of his recent album Pure Comedy. Psych rockers the Black Angels highlight the dark grunge of Death Song. Austin City Limits Austin City Limits (ACL) offers viewers unparalleled access to featured acts in an intimate setting that provides a platform for artists to deliver inspired, memorable, full-length performances. The program is taped live before a concert audience from The Moody Theater in downtown Austin. ACL is the longest-running music series in American television history .Since its inception, the groundbreaking music series has become an institution that’s helped secure Austin’s reputation as the Live Music Capital of the World.